The Matrx Lo Contour AirFlo features a non-contoured front end for very active users or to accommodate "windswept" deformities. The AirFlo is an excellent choice for those with a history of, or considered to be at very high risk of developing skin breakdown. The postural support layer provides support and stability to the legs, assists in pressure redistribution, and reduces shear due to sliding. 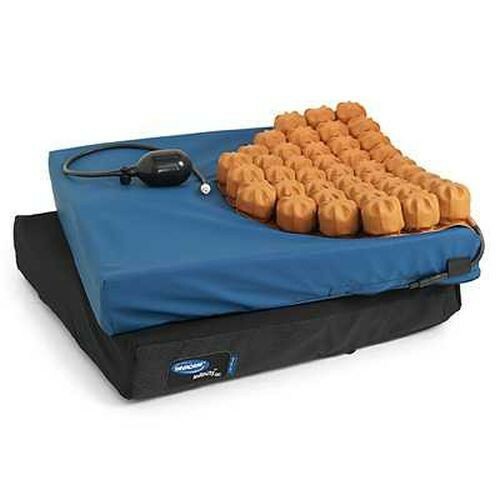 The air flotation insert inflates to provide optimal immersion of bony prominences. The user-friendly inflation bulb allows one-handed adjustment of inflation level, while the quick-disconnection system seals the air instantly when detached. Each AirFlo comes with two covers -- a moisture-proof, antimicrobial inner cover to protect the foam, and a highly stretchable outer cover provides maximum conformity to user's shape.